If you live in Australia and are a fan of the television series My Kitchen Rules (MKR) then you would definitely remember Sydney contestants Luke Hines & Scott Gooding from last season. During the series, the friends impressed us with their paleo-style cooking and clean living philosophy. 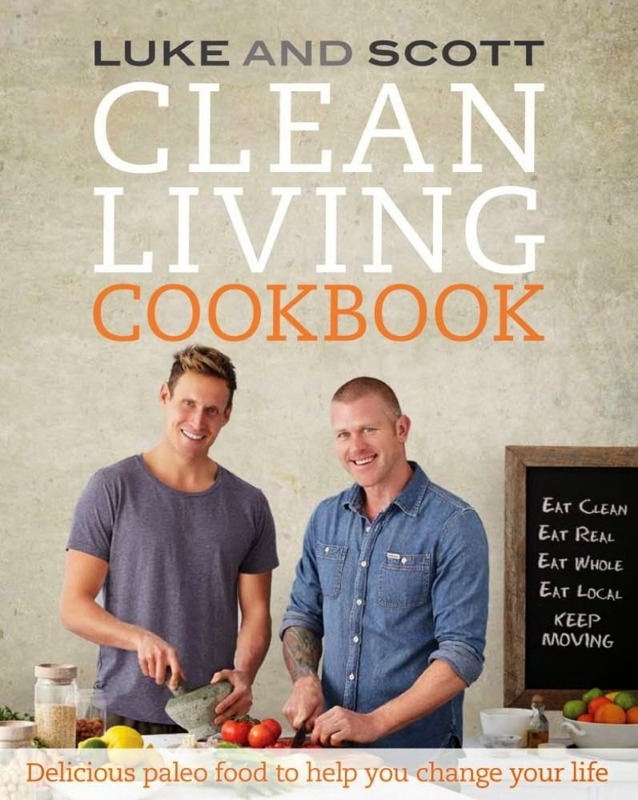 This cookbook really does inspire healthy eating. Divided into five sections the cookbook takes readers through from Breakfast to Dessert with an additional section titled Salads, Sides & Smoothies. Recipes are straightforward and easy to follow - many with only 3 or 4 steps involved. Breakfast highlights include Bacon & Zucchini Muffins, Banana Scramble with Pecans and Sweet Potato Fritters w/ Smoked Salmon. I was excited to see a recipe for Kale Pesto Scrambled Eggs featured in the cookbook, though I think it would have been better suited to the Breakfast rather than the Lunch section. Other favourites include Slow Cooked Beef Cheeks, Dukkah Lamb Cutlets w/ Zucchini & Pear Salad, Superfood Soup, and Baby Kale, Roasted Beetroot, Brussels and Walnut Salad ( featured below)*. Those looking for healthier sweet options will not be disappointed. Choices include a Raw Raspberry Cheesecake which features a base made with macadamia nuts and fresh dates, a Frozen Health Fudge packed full of nuts, fruit and spices, and a Chocolate Mousse made using ripe avocados. guaranteed to please – plus it’s easy! 1. Preheat the oven to 200°C. Wrap the beetroots individually in foil and pop in the oven for 1–1½hours. Remove from the oven when you can push a knife into the centre of the beetroots without resistance. 2. Once the beetroots have cooled, remove the foil, then use a vegetable peeler to scrape their skinoff. Cut into wedges and set them aside. 3. Pop the leeks into a pot of salted water, bring to the boil, and simmer for 10–12 minutes. 5. Melt a little coconut oil in a frying pan over a medium heat and pop in the brussel sprouts. Add a pinch of sea salt and keep turning the sprouts for about 3–4 minutes, until they begin to soften,then take them off the heat and set aside to cool. 6. Combine the dressing ingredients in a small bowl. 7. Once the leeks and brussel sprouts are at room temperature, combine them with the coriander,baby kale and beetroot. 8. Serve on a large platter and drizzle the dressing over the salad. Yes, It's really true that "This cookbook really does inspire healthy eating." 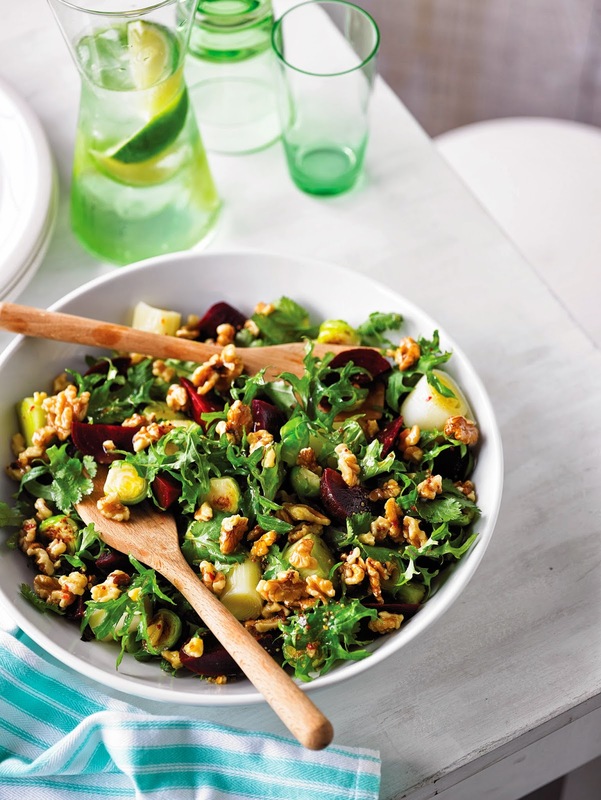 and the recipe you give it's really easy to make and awesome " Baby Kale, Roasted Beetroot, Brussels and Walnut Salad".